Elektron 2 was launched on 30.01.1964 with Elektron 1, while Elektron 4 was launched on 10.07.1964 with Elektron 3. Elektron 2 and 4, with a design mass of 460 kg, were boosted into a high 450 × 60,000 km orbit to map the outer Van Allen belt, simultaneous with Elektron 1 and 3's study of the inner radiation belt. To attain this orbit it used a perigee kick motor - a solid rocket of 3350 kgf and 12 to 15 seconds duration. Elektron 2 and 4 were 400 mm in diameter and 850 mm long. 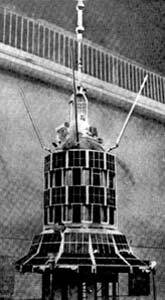 The spacecraft also measured cosmic rays and the upper atmosphere.